"The sacrifice known as Govardhana-puja is observed in the Krishna consciousness movement. Lord Caitanya has recommended that since Krishna is worshipable, so His land, Vrndavana and Govardhana Hill, are also worshipable. To confirm this statement, Lord Krishna said that Govardhana Puja is as good as worship of Him. 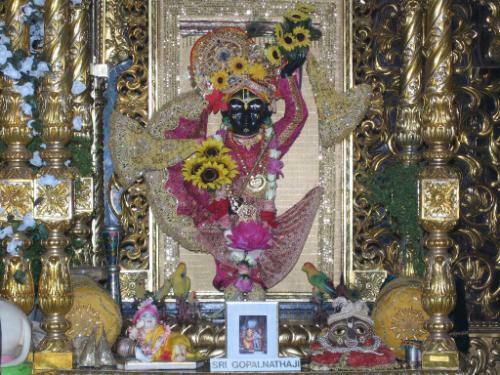 From that day, the Govardhana Puja has been still going on and is known as Annakuta. In all the temples of Vrndavana or outside of Vrndavana, huge quantities of food are prepared in this ceremony and are very sumptuously distributed to the general population."